We are all selfish people, one way or another. Whether it is that mad dash for the last item on sale, or the rude behaviour on the roads, we all have tendencies to see our own points of view as more "right" than others, more "honourable" than others, and more "reasonable" than others. The trouble is, perspectives are often skewed toward our individual selves. In one word, it is "selfishness." My main point this week is this: If selfishness points one to seek answers away from God, I wonder what selflessness or unselfishness can do? 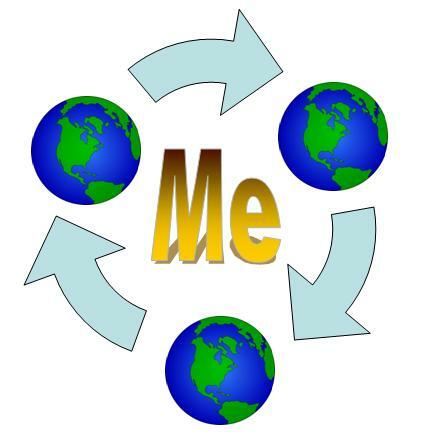 Selfishness: The Whole World is about Me. In a book that launched him to world fame, the famous new atheist, Richard Dawkins, popularizes the idea of "The Selfish Gene." It is a book that trumpets natural selection and evolution. He offers his work as an observation of the behaviour of the human species rather than to try to explain its origin or purpose. It is this very dominant "selfish gene" that will come up tops in the survival of the fittest. The key theme in Dawkins's work is that the whole of life is dependent on a "replicator," something that reproduces itself for survival. My question is, what comes BEFORE this replicator? Dawkins tries to uphold the doctrine of evolution, that there is no such thing as God, or a Creator. By pinning the the reasons for human selfishness on the gene itself, Dawkins liberates human people from taking direct responsibility, and to blame something else for all their problems. Yet, Dawkins is quick to point out that his book is about "altruism" rather than "selfishness" per se. How he justifies it is beyond me. For that matter, he even advocates that his book is more about the "altruistic" gene. Fine. If that is so, then why the title? Dawkins tries to be playful about it all by saying: "Let us try to teach generosity and altruism because we are born selfish." Through "natural selection," people with selfish genes can actually come together for the common good. I read it as him saying, since we are naturally selfish, why not just be selfish together for the common good? Great. Like a slippery eel, there is no way for anyone to catch a circular argument, which points back to Dawkins's sleuthic insistence of: "Firstly, I am right, and secondly, if you think I am wrong, refer to the first statement." This is evident even in the many ways Dawkins attempts to deflect criticisms in his latest preface to his 30th Anniversary edition of "The Selfish Gene." If there is anything good from Dawkins's book, it is his title. It points us to ask why is it "selfish" in the first place? Dawkins prefers to call his book a treatise based on "science." Yet he himself tries to talk about things outside of science, and when he approaches unfamiliar territory of human behaviour and motives, he makes excuses to say that his work does not cover that. In fact, Dawkins is so adamant about natural selection and the superiority of science that I feel it has become his own dogma, his own religion, his god. As one who has studied the sciences and the engineering of life, I can say that even science is based on a series of assumptions. If that is the case, why is Dawkins so cocksure that his central tenets of faith in science and the natural selection of evolution is so right? By setting out to be atheistic in the first place, has he unwittingly cut out the faith element? In fact, it takes a greater leap of faith to believe in Dawkins's treatise than to trust the God of the Bible. Selfish behaviour is everywhere. I remember one ex-colleague of mine complaining about his boss. "He only cares for himself." The trouble is, I thought to myself, aren't we all caring merely for ourselves too? For every ten people, we will be challenged to find even one who is selfless in their actions. Even in churches, we have this pareto of 10% of the people doing 90% of the work. Is the lack of Christian service an indication of sin even among Christian people? There is a strong link. I know of friends who have a hard time trying to get people to serve in their churches. They work their hearts out. They call for volunteers. The responses are few and pathetic. Even the few who responded have their own conditions set forth. I'm not free. Call someone else. Who are you to ask me? Some senior pastors caught in the bind take up the slack by making their junior staff do the rest of the work. Whether it is driving members to and from church, or leading in singing sessions, or conduct Bible studies, when ordinary members do not want to volunteer, those who are paid have no choice but to pick up the duties no one else wants to do. After all, like what some church members are quick to say: "They are paid after all, right?" Wrong. A Church is not about distinguishing paid vs unpaid volunteers. It is about coming together to serve one another joyfully and without counting one another's contributions. I have been studying Jerry Bridges's book on "Respectable Sins" for the past few months with some people from Church. Last week, we touched on the topic of selfishness. Bridges highlights four areas in which people are typically selfish with. Voila! We are selfish in the first place because of sin. Each act of selfishness points us away from God. On the contrary, each act of selflessness and unselfishness provides us glimpses of the glory of God. This week, I have seen examples of unselfishness occurring in the community I am in. Individuals volunteer to help out in Church. People reach out to the needy, even giving out money to those who cannot pay rent. Encouragement flows unexpectedly. I see unselfishness creating a warm feeling inside the hearts of people, that sometimes leads to tears of joy. When unselfishness happens, selfishness takes a back seat. Let me close. Any attempt to blame our genetic makeup for any selfish behaviour is not only silly, but downright irresponsible. After all, we have a choice, and we always have the power to make that choice for good, instead of relying on some mechanism inside of us. It is this choice that Dawkins himself agrees that can be used against the "selfish gene" in us. The Bible is very clear that there is something behind anything that is selfish by nature. Sin. Even the prophet Daniel is quick to pray for forgiveness. Imagine that. The man who lived righteously in a foreign land, who had resolved not to defile himself, who braved ferocious lions, and survived the fiery furnace. He too confessed sinful behaviour. While the key goal for Dawkins theory of the "selfish gene" is for physical survival, the confession of Daniel goes beyond surviving physically. He has a spiritual perspective that we are already sinful, and we need help. Physically, whether we like it or not, we are all going to die one day. If that is so, rather than to live this present day with a mysterious dependence on a mysterious natural selection, why not place it on a known Person who walked the earth 2000 years ago, and who has proclaimed that He is the Truth, the Way, and the Life? Trust not in any genetic makeup. Trust in the One who knows us in and out, genes and all.